In Holland, December 5, the name day of Saint Nicholas, is a big celebration day especially for children. On this day they receive lots of presents and candy, distributed by Saint Nicholas (who somewhat resembles Santa Claus) and his black valets: the Black Petes. Because of the Dutch past as slave traders, since last year there have been big discussions in Holland about the skin colour of Black Pete. Because he is the valet, people no longer want him to be black. Last week, visiting a Greek friend, I thought I saw a puppet picturing a Black Pete hanging on the chimney. When I looked at it closely it indeed had a black face but looked more like a troll. I completely forgot that, similar to the Black Petes in Holland, in December in Greece there are also creatures entering houses through the chimney: the kallikantzaros. These are little monsters which live underground where they try to cut down the world tree. At Christmas, when they are nearly done with their job, they are allowed to come above ground and they love that so much that they forget all about the world tree. However they have to be careful with water, fire, light and a cross. At Epiphany on January 6, soon as the priests bless the sea, rivers and other waters the kallikantzaros return underground, where they discover that the world tree has become renewed and they have to start sawing the tree all over. Kallikantzaros are a kind of black gnome, but they may also have goat legs, a donkey’s tail or other animal aspects. What they enjoy most is to spoil food or drinks, haunt houses and frighten people by moving furniture and so on. There are different ways in which to keep those little bullies outside the house: lighting a fire in the fireplace and keep it lit throughout the night (in some regions they even lay a special log in the fireplace that keeps burning for days). You can put a black cross on your front door or hang a sieve or a bundle of flax at the front door (Kallikantzaros love to count, but only up to two; this way you keep them busy outside). A child born on Christmas Day means real trouble, because a Christmas child can change into a Kallikantzaros. The way to protect it is to cover the poor baby with garlic. As far as I know there are no people in Greece who care about how a kallikantzaros looks. There are regional variations, but they are mostly black. Greece however has no past with black slaves. Most slaves in ancient Greece were white and even also Greek. Since the ancient times there were slaves in Greece, because where there was war, there was looting and along with expensive goods, taking the losing people as slaves was common practice. It was like that in those times all over the world and so ancient Greek writers and philosophers did not see harm in it. During the Roman Empire slavery was booming and in each town you could find a slave market. After Rome, the biggest market was in Ephesus (now in Turkey, near the shores opposite Samos) and the Greek island of Delos was also known for its slave market. The first Gattilusio who took power over Lesvos originally was a pirate. One century later the last Gattilusio of the Italian family reigning over Lesvos murdered his brother to become ruler, but that did not bring him luck: a little later, in 1462, the Ottoman Empire conquered the island and he and his family were taken to Constantinople as slaves. The pirates around the Mediterranean were known as the Barbary corsairs. After many sea battles and attacks on the pirate settlements (the biggest and last one being Algiers) sea powers like England, Spain, France, Holland and the just founded United States (see: Barbary Wars) managed around 1830 to get the coasts and the sea safe. Corsairs not only came from the Ottoman Empire or from Africa. You’d better not have bumped into the Englishman Jack Ward, or the Dutchmen Simon de Danser (Zymen Danseker) or Ivan Dirkie de Veenboer (Sulayman Reis). 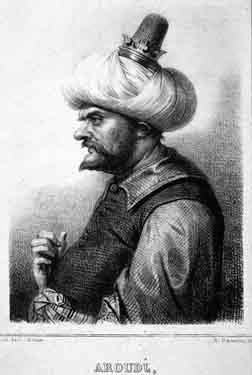 However, the most notorious pirates came from Lesvos: Oruç and Hizir Hayreddin, better known as the brothers Barbarossa. This did not mean that the inhabitants of Lesvos did not have to fear the corsairs. Also in Mytilini there used to be a slave market, and as on all Greek islands nobody was crazy enough to live at the seaside in an unprotected village. Possibly the people in Petra thought they were safe because of their Maria-Glikofiloussa church. In 1675 the French corsair Hugo de Crevellier visited this little village and not only left it in ruins but also took 500 villagers and sold them on as slaves. The Taxiarchis Monastery of Mandamados also was once attacked by pirates, but the story goes that the monks were murdered and the sole survivor created an icon with mud and the blood of his brothers, an icon now still is said to provide miracles. Pirates have of course nothing to do with Christmas, nor with kallikantzaros. Although, when you look at an etching of Barbarossa, he could have been a big kallikantzaros, or even a Black Pete. The difference between the slavery around the Mediterranean and in America was that in America most were black slaves, but in Europe it were mostly white Christians who became the slaves of the darker muslims. May that be a reason why the kallikantzaroi are little black men?